You can still buy from Moog today the same sort of Theremin that was described in this 1961 Carl & Jerry episode. 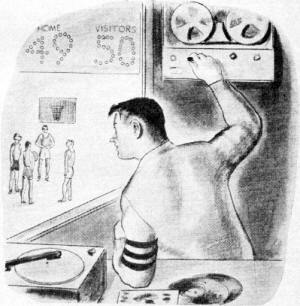 Ever the early adopters of breaking technology, the teenagers exploit the motion-sensitive feature of the Theremin in hopes of improving Carl's basketball game. As usual the boys, in mock dialog, describe the Theremin's operational theory for the benefit of readers not familiar with the musical instrument. They do not, however, mention that the device is named after its Russian inventor, Léon Theremin, who patented the device in 1928. 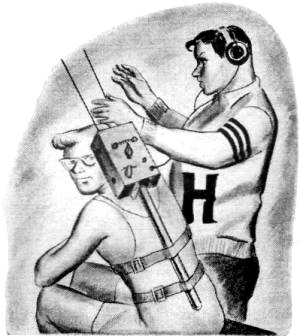 Read on to discover how a Theremin strapped to Jerry's back was used to help Carl be a better free-thrower. The huge high school gymnasium was dark and empty except for a spot­lighted basketball goal down at one end of the floor and the shadowy figures of Carl and Jerry standing beneath it. 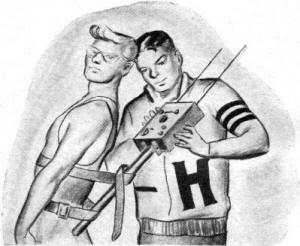 Carl was clad in his basketball uniform, but Jerry was wearing his usual shapeless sweater and fashionably beat-up cords. "I must have been out of my cotton-picking mind when I let you talk me into this caper," Carl muttered while Jerry busied himself strapping a strange apparatus to the broad back of his athletic chum. Belts around Carl's waist and chest held a broomstick erect at his back so that the handle rose a few inches above his left shoulder. Fastened at the top of the handle was a small aluminum chassis box with dials, jacks, and switches on the back of it. Two quarter-inch aluminum tubes stuck out the top of the box and went straight up, side by side and some six inches apart, for a distance of a couple of feet. "You want to improve your free-throwing, don't you?" Jerry demanded, as he threw a switch on the little box. "Let's go over and sit down for a few minutes while those oscillators stabilize." "Yeah," Carl agreed, seating himself gingerly on the substitutes' bench, "but I keep wondering if the Globetrotters started this way. Tell me again about this thing riding my back." "The little box contains the tone-generating sections of two separate theremins," Jerry replied, stretching out on his back and closing his eyes. "You know what a theremin is and how it works, don't you ?" 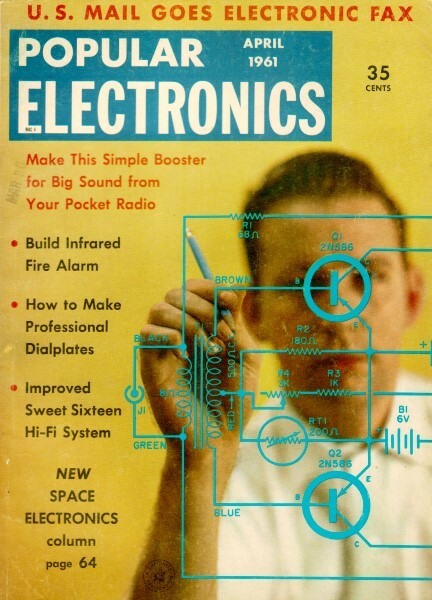 Robert Moog's Theremin that appeared in the January 1961 edition of Electronics World..
"I know it's a musical instrument played by just waving the hands near a couple of rods or plates. I think the motion of one hand controls the pitch of the tone produced, and the motion of the other controls the volume. But I've only a very foggy notion of how this is done." "All right, let's think about the tone-generating portion first," Jerry suggested. "It consists of a couple of oscillators operating around 150 kc. In this case the oscillators are transistorized, because I copied them from a construction article on a transistorized theremin that appeared in the January 1961, issue of Electronics World. .
"The outputs of both oscillators are fed to a diode mixer that combines them and produces an audio signal with a pitch equal to any difference in frequency between the oscillators. One oscillator stays on the same frequency all the time. The other has a sense antenna, usually a metal rod or tube, connected to its frequency-determining circuit so that any capacity between this antenna and an object brought near it, like a human hand, adds capacitance to the circuit and lowers the frequency of the oscillator. The amount of capacitance depends on how near the hand is held to the sense antenna - the closer the hand, the greater the capacitance. "This, of course, changes the difference-frequency between the two oscillators and so changes the pitch of the tone produced by the instrument. Since the actual amount of hand-capacity is quite small, a circuit is used with the sense antenna that effectively amplifies this hand-capacity. When the variable oscillator is tuned to zero-beat the fixed oscillator with the hand away from the sense antenna, moving the hand toward the antenna from about a foot and a half away will cause the audio tone to go up several octaves from a very low pitch." "I'm with you so far," said Carl, "but how does moving the other hand change the volume?" "The volume control circuit uses another low-frequency oscillator," continued Jerry. "A resistor connects the tank circuit of this oscillator to a series-tuned circuit resonated near the oscillator frequency. The resistor and the tuned circuit form an r.f. voltage divider across the oscillator tank. A diode rectifies any r.f. voltage appearing at the junction point, and the d.c. thus produced is applied as bias to a transistor amplifying the signal delivered by the tone-generating portion. When do you think the least r.f. 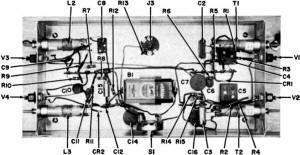 voltage will appear at the junction of the resistor and tuned circuit ?" "When the circuit is tuned to the resonant frequency of the oscillator," Carl answered promptly. "A series-tuned circuit has a very low impedance at its resonant frequency, but this impedance goes up rapidly as the circuit is detuned either way." "Exactly right. The tuned circuit is adjusted to resonance with the left hand away from a metal plate that is connected to the tuned circuit. Under these conditions, practically no bias voltage is produced, and the amplifier works at full output. "As the hand is brought nearer the plate," Jerry went on, "hand capacity causes the resonant frequency of this tuned circuit to go lower than the oscillator frequency. The impedance of the series-tuned circuit rises, as does the amount of bias voltage developed. This voltage reduces the output of the amplifier. In fact, when the hand is about an inch away from the volume control plate, the amplifier is completely cut off. "Now this volume-controlling action is interesting, but it doesn't concern 'Therry' here. He just has two tone-generating systems, each with its own antenna, and without any volume control portions. Let's see if he's operating." 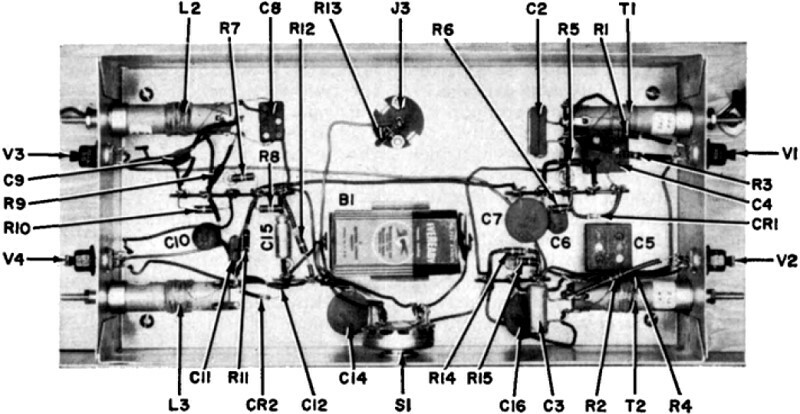 Jerry plugged a pair of stereophonic earphones into a jack at the rear of the aluminum box and moved his hand experimentally around the two antennas. Satisfied, he handed the earphones to Carl. "I spent a lot of time making those two tone generators perform exactly alike," Jerry said. "Notice that when I move my hand away from the middle of the two antennas along a line that keeps it equally distant from both, the tones heard in both ears stay exactly in step for all positions of the hand. But when I deviate from this line, even a little bit, the tones are different. The tone coming from the antenna nearest the hand is higher in frequency. Now let's see if Therry really works." They moved to the foul circle, and Carl started pushing up shots at the basket. 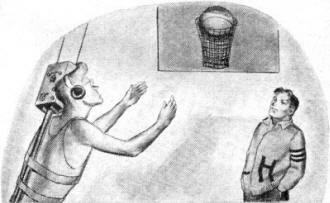 Jerry, wearing the earphones, kept twisting the broomhandle until the antennas were in a position where the sound he heard when Carl made a basket was a single-tone eeeoooop, This was produced by the rapid movement of Carl's left hand going up at an angle from the bottom center of the two antennas and keeping equally distant from them until the ball left his fingers. 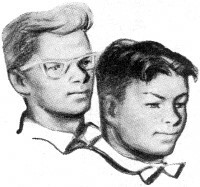 At this point Jerry placed the earphones on Carl's head, and connected a tape recorder to the output of one of the theremin units. Then he fed balls back to Carl while the latter continued pushing them up at the rim of the basket. Maybe it was chance, maybe it was that listening to the sound somehow unlocked the foul-shooting block that Carl had recently developed; but his percentage of goals went up sharply soon after he put on the earphones. Finally he hit eleven in a row, and then closed his eyes tightly and lifted a twelfth straight through the hoop guided only by the sound in the earphones. "I'll quit on that one," Carl said with a pleased grin as he began to unstrap the device from his back; "but I believe old Therry here helps. Anyway, let's all three. of us do this some more every night until the big game Friday." Jerry made an endless loop of tape carrying the theremin sound of a perfect shot, and each evening before Carl started practicing, Jerry would let this run a few times over the gymnasium sound system, to "prime the pump" as he put it. Carl's percentage of good shots not only continued at the same high level but actually improved. The theory was that Jerry permitted another sense to be brought to bear on the acquiring of a skill. Carl's eyes could follow critically the arc of the ball; from his muscles and joints came a kinesthetic sensation of the wrong and right movements; and now his ears could hear the difference between hits and misses. Friday night the gym was filled to the rafters for the game with the Pottsville Pirates. The Pirates and the hometown Huckleberries had been traditional enemies for many years, and as far as either town was concerned this was the most important game of the season. Jerry, as usual, was working the sound system; and he watched anxiously to see if Carl would be in the starting line-up. He breathed a sigh of relief as he saw his chum preparing to jump center against a rangy Pirate at least two inches taller, but he couldn't help thinking Carl looked a little naked without Therry strapped to his back. The game was fought bitterly right from the start. At the half, the Huckleberries led by three points; but in spite of everything they could do, the Pirates relentlessly overhauled them and forged ahead by two full field goals at the end of the third quarter. When the Huckleberries came running out on the floor at the beginning of the last quarter, Jerry could see that Carl's jaw was set in a grim line. Carl and the other Huckleberries played furiously, but the Pirates fought back just as hard. The battle raged up and down the floor as the seconds ticked away on the time clock. The score was 50 to 49 in favor of the Pirates. Finally, when the timekeeper was holding his pistol aloft with his eyes glued to the clock, Carl stole the ball from under the Pirates' goal and came charging down the floor. From far out, he leaped into the air and fired a desperate long shot at the basket as clawing Pirate hands tore at his wrists and the final gun rang in his ears. The ball hit the backboard, fell down to the rim of the basket, rolled tantalizingly around it, then fell outside. A deep groan arose from the Huckleberry rooting section. But the referee was blasting away on his whistle and holding up two fingers while he waved Carl to the foul circle. It was very quiet in the gymnasium as Carl deliberately bounced the ball a couple of times before trying his first free throw. Jerry could see that the muscles in his shoulders were bunched with tension. When Carl attempted the shot, it did not even come close; and a murmur of disappointment ran over the crowd. Up in the sound booth, Jerry made a quick decision. He switched the tape recorder into the P.A. system and started the loop of tape on it moving past the tape heads. "Eeeeoooop, eeeeoooop, eeeeoooop!" was the sound that suddenly burst from the speakers, and hundreds of eyes turned to shoot indignant looks at Jerry. But the latter, watching his friend down on the floor, saw the tenseness go out of Carl. Confidently Carl pushed the ball up in one easy, effortless motion. The ball swished through the hoop without touching it! The ensuing overtime to break the tie was really anticlimactic. Nothing could stop the exuberant Huckleberries now, and the final score was 58 to 52 in their favor. The fans swarmed around Carl and literally carried him off the floor. But as they surged past the sound booth, Carl looked at Jerry and threw up a long arm to make an appreciative, triumphant gesture with a circled thumb and forefinger. Therry was being given the credit for winning the game!